You have probably heard it was my birthday last Saturday (I didn’t shut up about it) and for my birthday I got a trip to London to see see 42nd Street and Heathers (my new fav musical). Now as I’m sure you can imagine, most of my trips away are meticulously planned and are full of food stops and this was no different. On a Monday we got the train into London in the afternoon as we were seeing 42nd Street that evening. Living in a small town I am used to researching places where I can eat vegan food so I searched the internet for somewhere to get something quickly before the show. I have heard a little bit about by CHLOE. so when I saw that it was literally opposite the theatre I knew I had to go there. The Covent Garden branch was the first in the UK but they have just opened another in London and they have lots of branches across America. 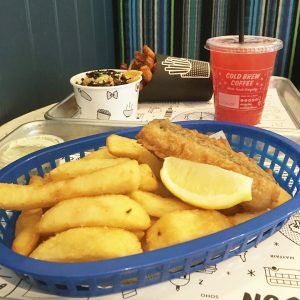 I saw that they had tofish and chips which is something I have tried to create at home and my non vegan husband liked so I knew he would enjoy it there too. There are burgers and salads (which actually looked amazing and I’m not a salad person) but I went for the Mac and cheese with mushroom bacon with a side of sweet potato fries and Billy had the fish and chips as I had predicted. My mac and cheese was delicious and although I went for a small one it was pretty filling with my fries. The flavour did sort of fade away the further I got into the pot but I think that might just be my taste buds now that I’m a grand old 25 years of age since it’s happened a lot recently! Billy enjoyed his fish and chips but we both agreed that the best bit were my sweet potato fries. They were the best I’ve ever had! I also had a seasonal lemonade that was raspberry and watermelon flavoured and was very refreshing, especially in the sunshine and after a long, delayed train journey. 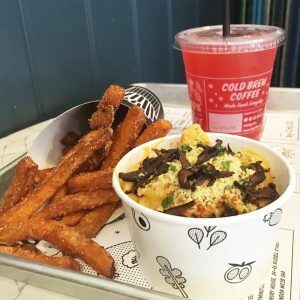 As a fast food restaurant it was slightly expensive but it was better quality than most fast food and I don’t mind paying a little bit more for really tasty and fast vegan food. The next day I wanted to go to Crumbs and Doilies so we decided to have a snacky lunch. We popped into a small Tesco’s and bought some snack pots of hummus with carrot sticks and falafel, some couscous and some boiled eggs for Billy and had a makeshift picnic. It was only a very light snack but enough to get us to SOHO and Crumbs and Doilies. 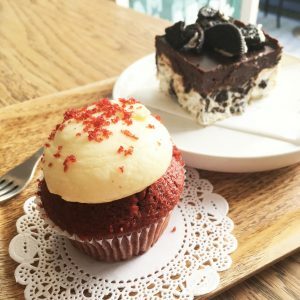 I had already looked up today’s flavours on their Instagram so I knew I was going to have the Red Velvet cupcake as it was the vegan option if the day. Last time I went in February it was the first day they had a vegan chocolate cupcake so it’s great to see they are introducing lots of new vegan flavours. Billy had Oreo Rocky Road which looked really good too. My cupcake was really moist and soft and you definitely wouldn’t have known it was vegan. I told myself I was going to have a mini one but after the long walk to the shop a normal large one seemed to hop into my mouth. Oops. On Tuesday night we had tickets to see Heathers at the Other Palace in Victoria. I had already made our dinner reservation for that night as I had a free birthday meal voucher from Zizzi and it just happened that I had been to the Zizzi near the theatre already so I knew where it was and that I could get vegan food from there. I booked early for 5.30pm so we had lots of time before the show to not feel rushed. I’ve had the vegan lentil Ragu from there before (read about that visit here) so this time I decided to go for a pizza. 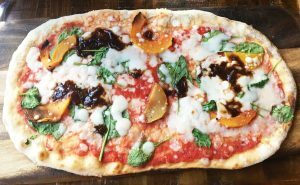 I had a vegan rustica zucca which had dairy free mozzarella, roasted butternut squash, tomato, caramelised onions and spinach. It was so tasty and Ineven liked the mozzarella (I usually have a thing against vegan cheese). The caramelised onions made it a bit different to your usual pizza but packed a lot of flavour. Billy had Spiedini Pescatore which is what he wanted last time but they had run out. It was basically seafood and veg on a hanging skewer and it came with the most delicious looking potatoes. I have to say that there really is something for everyone at Zizzi no matter what your preferences or dietary requirements. It can be slightly more expensive than other chain restaurants but there are always vouchers and codes which make it very reasonable. 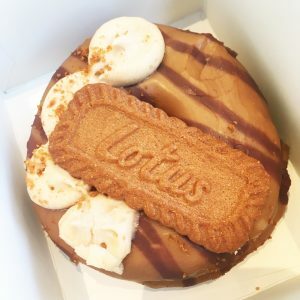 I noticed that there was a Doughnut Time around the corner and earlier in the day I had seen a post on Instagram of a Biscoff doughnut from there that was vegan. I was so excited that they did vegan doughnuts that I just had to get one despite the fact I’d already had a massive cupcake earlier. It’s only your birthday week once a year. There ar3 actually a few doughnuts that are vegan including a massive jam filled one and a red velvet one that I was very tempted by but since my cupcake was red velvet I went for the Biscoff. It had a coffee flavoured glaze which I didn’t know if I’d like but it complimented it so much because it balanced out the sweetness. The buttercream on top was Biscoff flavoured and it had a chocolate drizzle too. They are quite expensive but worth it for the sake of trying it. I’d pay it again if there was a flavour that I fancied (I say I’d pay it again but this one was a treat from Billy anyway). On Wednesday we got lunch at Bella Italia. We both have the Wuntu app for three customers which often has eat for £3 codes and since we wanted something quick before our train at 2.40 we went to the Bella Italia on Baker Street as it was close to Regents Park where we were and we knew it would be fast and tasty and there would be vegan options. Much better than the £3 meal deal we were planning on grabbing at the station! Billy had a pizza but I didn’t really want another pizza which left me with the option of either Lenticchie (spaghetti with lentil and mushroom ragu) or Pomodoro (pasta in tomato sauce). You probably know that I’m the most awkward vegan and I HATE mushrooms so I had to go with the Pomodoro. 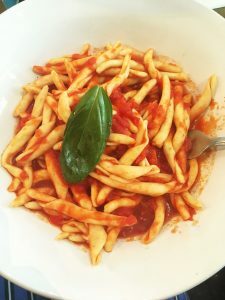 It’s not something I’d usually choose as I prefer sauces with less tomato and this was literally just pasta and tomato sauce but when it came and I tried a bit I was so pleased I had it because it was delicious. The fresh pasta swirls had a bite to them and the tomato sauce was rich but not tangy like I thought it would be. The only problem was that I splattered it everywhere! I think my tastebuds must be changing after quarter of a century as I also had a pineapple juice when I never used to like pineapple. Maybe it’s the heatwave we’re having at the moment. We’ll see. So that was our trip to London in food. I know there is a couple of your chain restaurants that you get in most towns and cities in there but we’re real people and this is how we eat. It’s nice to go to new places and try out new food but it’s also nice to be able to pop in somewhere that you know you will cater to you and isn’t overly expensive. If you’re interested int he musicals by the way 42nd Street was very good, the tapping was amazing and is great especially for people who like traditional, big musicals but Heathers is my new favourite musical. It’s darkly funny, has modern numbers and I was sitting on the front row which was an amazing experience!